Calgary, AB – This month, for the first time in recorded history, single person households are now the most common type in Canada*. “As living alone comes to represent the situation of an increasingly large segment of the Canadian population, housing demands and affordability issues associated with this lifestyle may grow in importance within society,” reports Statistics Canada. Young people, he said, are drawn to the location at 320 19th Avenue SW, just steps away from the 17th Avenue strip, by the dynamic restaurant scene, shopping and nightlife. Both the Erlton LRT and Stampede Park are within easy walking distance and 4th Street, with its shops, restaurants and annual Lilac Festival, is literally just around the corner. The Matrix boasts a walking score of 96 and a bike score of 100, according to walkscore.com, an important factor to the younger demographic. “Walkability is very important to younger buyers,” said Zebian, noting Matrix’s own survey of potential buyers found the overwhelming reason for condominium ownership is the proximity to downtown and a walkable lifestyle as 68 per cent of those polled listed it as a top priority for 68 per cent of those polled. Affordability is also a prime concern. A survey the developer, Mission 19 Ltd., conducted last fall of more than 190 interested parties found that more than 60 per cent were seeking to buy a condominium within the next year, but the top two factors holding them back are high monthly payments and saving for a down payment. “The majority of potential buyers (55 per cent) looking in Mission are seeking to purchase in the $300-$400k range, but with 30 per cent hoping to secure ownership under $300k, the Matrix is making affordability a priority,” said Zebian. To that end, the Matrix has a ‘No Money Down’ offer with special financing for a five per cent down payment loan available and payments spread over 24 months, OAC. Plus, to protect buyers from mortgage rate increases, the Matrix is extending 24 and 36-month interest rate holds to all buyers. Interest-only mortgages are also available offering 37 per cent reductions in monthly mortgage payments. Originally a Francophone settlement, Mission was one of the earliest non-Native settlements in the Calgary area and the earliest Roman Catholic centre in southern Alberta. It was the goal of one of the Catholic missionaries, Father Albert Lacombe, to preserve a French-speaking, Catholic area in southern Alberta. St. Mary’s School was established in 1885, initially using a two-storey log cabin convent in Mission district (Rouleauville). It is now the oldest school still operating in Calgary (though in a newer building). In 1889 St. Mary’s Church was founded, and in 1912 it became St. Mary’s Cathedral when it became the seat of the newly formed Diocese of Calgary. What was then the village of Rouleauville became part of Calgary in 1907, at which time all the French names of streets were replaced by the current street numbering system. Fast forward to 2019 and Mission is one of the city’s most vibrant and youthful communities, with a median age of 34 compared to 36 for the rest of Calgary. The Matrix project is a collaboration between Mission 19 ltd. And Gravity Architecture, who’ve come up with a plan “that balances the old and new in perfect complement to the location’” says developer Harold Sicherman, who has a 20-year history in the neighborhood including the launch of the District condominium in 2013. 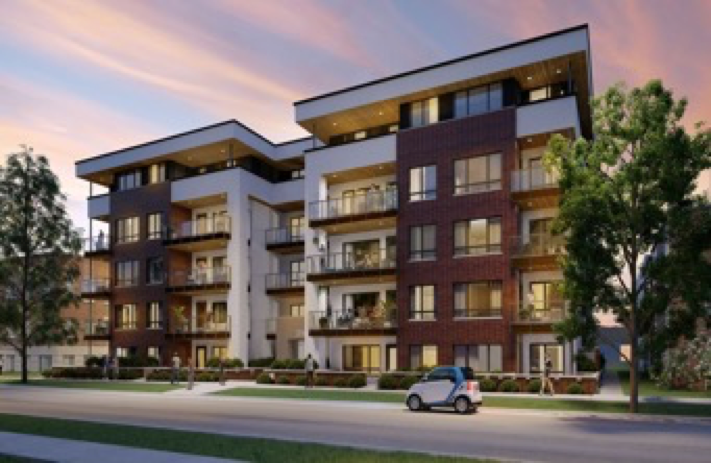 Matrix will have 67 units at build-out, with five individual one and two bedroom units ranging from 612 to 868 square-feet. Twelve of the units are listed under $299,990, with the top floor suites designed to have a penthouse feel and priced at $471,350. All units feature nine-foot ceilings, kitchens with stainless steel appliances including gas cooktop, and bathrooms with ample storage, decorative porcelain tile and luxurious Valley fixtures. Residents also benefit from secure heated underground parking, personal storage space, bicycle parking, and a dog wash. The Matrix Presentation Centre and show suite is located at 117 17th Ave. SE and is open noon to 6 p.m. Monday through Thursday, and noon to 5 p.m. on weekends. To view the Matrix media kit, please click here.